Even with a city packed full of tourists for the July 4th weekend, the 2016 World Series of Poker continued on Monday with one bracelet winner and another day of action in the $50,000 Poker Players Championship event, which got past the bubble and saw the same name at the top of the chip counts throughout the day. Many amateur poker players dream of going to the WSOP and hitting the jackpot. Whether it’s a bracelet, a big score or both, the WSOP is where poker players come to make it happen. 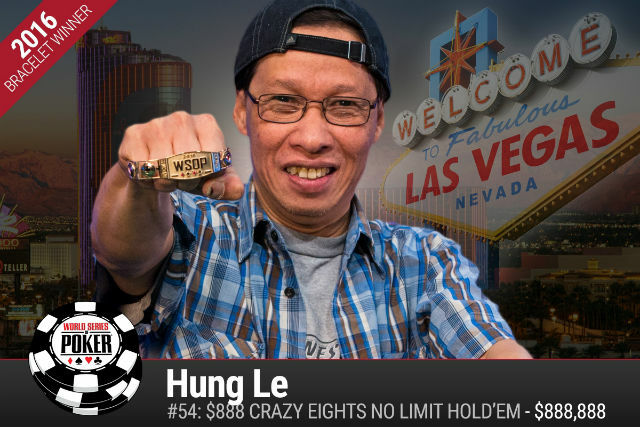 That’s exactly what Hung Le did on Monday night, winning the $888 Crazy Eights event and walking away with $888,888. The 53-year-old Vietnamese immigrant beat out a final table that included bracelet winner Loni Harwood and former PokerStars Caribbean Adventure Main Event champion Dimitar Danchev. His previous biggest score came in 2014 when he won $8,208 for taking down a Hollywood Poker Open event in Columbus, OH. Day 3 of the $50,000 Poker Players Championship began with Justin Bonomo leading the final 42 players. Jason Mercier and Howard Lederer were also in the hunt for the bracelet and Chip Reese Memorial Trophy. Ten levels of play didn’t change the name at the top but those three players, and 26 others were eliminated on Monday. Bonomo finished on top with 3,127,000. Behind him is the player who denied Mercier a bracelet earlier this summer, Ray Dehkharghani, with 2,662,000. Lamar Wilkinson rounds out the top three with 2,659,000. Michael Mizrachi. who won this event in 2010 and 2012, is still in contention for his third PPC title after bagging up 2,016,000 on Monday. Georgios Sotiropoulos was eliminated by Eric Wasserson on the bubble. A few minutes later, Robert Mizrachi was eliminated in 14th place. Lederer and Mercier weren’t the only notable eliminated without cashing on Monday. Todd Brunson, James Obst, Scott Seiver and Phil Hellmuth were also among the Monday casualties. Hellmuth took his elimination in stride. Not only am I at peace w it, I have a ton of #POSITIVITY right now. Maybe something great will happen in the next 14 days? #WSOPBracelet15? The final 13 players get cards in the air at 2 PM PT. Matt Affleck was one of just two players to finish Day 2 of the $1,500 No Limit Hold’em event with over one million chips. Affleck finished on top with 1,420,000 while Kilian Kramer ended the day with 1,250,000. Just 28 players remain in event after Day 2. Included in that group is David Peters (579,000), Dar O’Kearney (484,000) and Faraz Jaka (423,000). David Nowakowski ended Day 2 of the $1,500 Pot Limit Omaha Hi-Lo event with the chip lead after eliminating two players on one hand. Nowakowski bagged up 1,203,000 – almost 500,000 ahead of any other player. Nowakowski has two previous WSOP cashes – both in Omaha Hi-Lo variants – but his last one came in 2011. Canadian Timothy Vukson is the player closest to Nowakowski. He ended Day 2 with 721,000. Only 16 players remain in the field including two-time bracelet winner Marco Johnson and former Main Event runner-up Martin Staskzo. The tournament resumes at 2 PM PT and is scheduled to play down to a winner on Tuesday. With the July 4th holiday occupying a good number of the players in Las Vegas, the WSOP schedule had only one event on the docket on Monday – a $1,000 buy-in No Limit Hold’em event with 30-minute levels. A total of 1,397 players played the event with only 28 making it through the first day. Leading the pack is Germany’s Enrico Rudelitz. He finished with 904,000 – exactly 300,000 more than his closest competitor, Mikhail Petrov. Some of the notables who made it through Day 1 include Fatima Moreira de Melo, Jordan Young, Ryan Riess and Martin Kozlov. The final 28 players will be back in action beginning at Noon PT on Tuesday and will play to a winner.